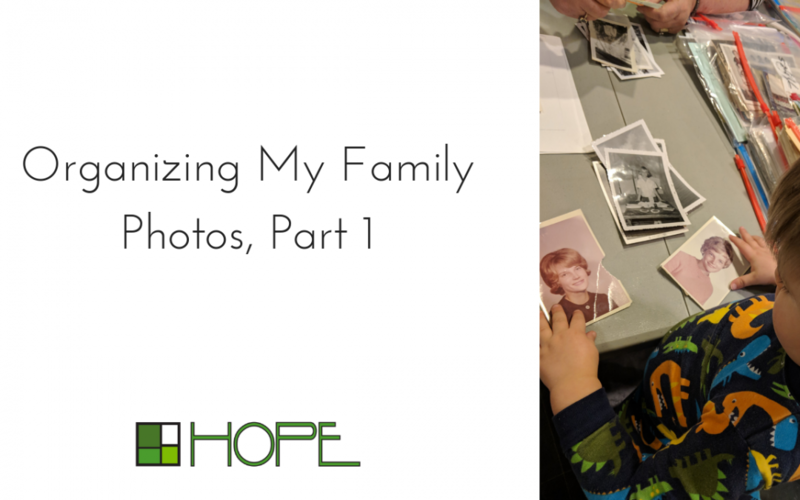 Total honesty here: this Omaha family photo organizer’s photos are not completely organized. I wish I could just devote several days to work on my own family’s photos, but most of the time I am spending time on client projects. Last year, I gave my parents each a BiographyNow* book, and I wanted to get my mom’s book done by her 70th birthday party! The biography was written, but we needed to collect the photos that would be the visuals in her book. I had access to mostly digital photos of my mom (Jane), but it was the older printed photos that we really needed to sort through and find our favorites. 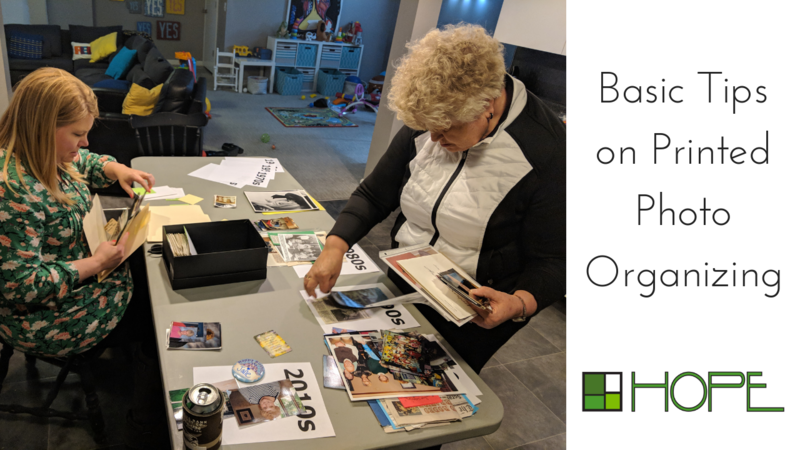 My mom gathered many of her older photo albums and any loose photos of herself and brought them to our house for a family organizing session. We started with a very broad sort. 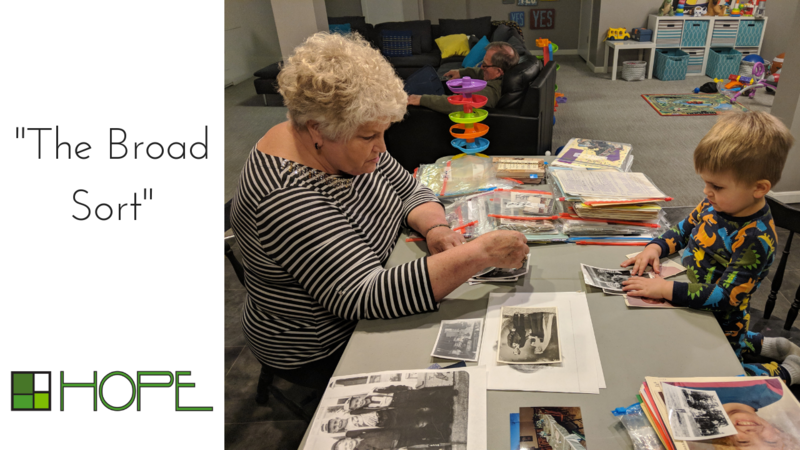 At this point, I scanned all the photos of my mom and then “pulled out” our 50 favorites from the digital files to tell the story of her life in her BiographyNow book. It’s much easier to work with someone else’s photos than your own because you are thinking through the memories (and thinking about your own bad hair years). It is better to do an entire family at once (if possible). Now that I need to do my dad’s book, I am finding more photos of my mom. We could have considered all the photos at once–and I wish I was just all done at one time. It is harder to take things out and keep starting the project over again. Gather all of your printed photos in one place (as much as possible). It is great to be able to see it all in one place. Choose your categories: Years, Family Members, or Themes (holidays, vacation, school, etc). My personal favorite is family members unless you already have everything. Have a basket or box for each category. Work in a space that is “out of the way” so you can leave the project out because it will take some time…or use a box (from the suggestion above) that you can easily put the project into and store it away until you have time to work on it next time. Make it fun but share the experience with other family members if possible. If it is too overwhelming to do on your own, contact HOPE Organizing to help you get started or simply to do the entire project for you! *Use coupon code HOPEORGANIZING at checkout on BiographyNow.com for a 10% discount!